This dish is a unique version of pork sinigang. 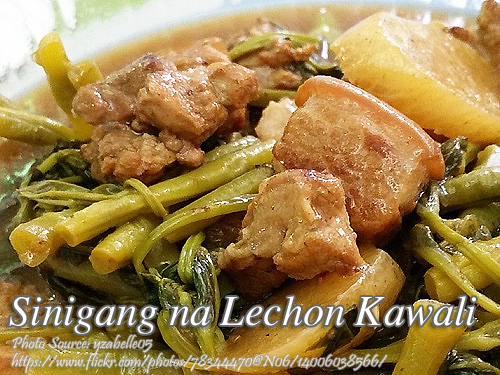 Instead of only boiling the raw pork with the tamarind broth, this sinigang na lechon kawali uses fried pork belly along with the sinigang broth and with the vegetables of course. This is a good way of recycling the left over lechon kawali you served in the holidays specially this coming Christmas and new year. I think you can also use lechon (roasted pig) instead of lechon kawali if lechon is what you have left after celebrating the holidays. When cooking the lechon kawali, as much as possible buy a whole pork belly slab. Don’t let the butcher or meat vendor slice it into thin strips because when you fry the pork that way, it will become hard and dry. Boil the whole slab or divide it to fit in the pot you are using and boil it until almost tender. Then deep fry the pork until golden brown and the skin is crispy. Slice it into serving pieces and toss it on the sinigang broth. 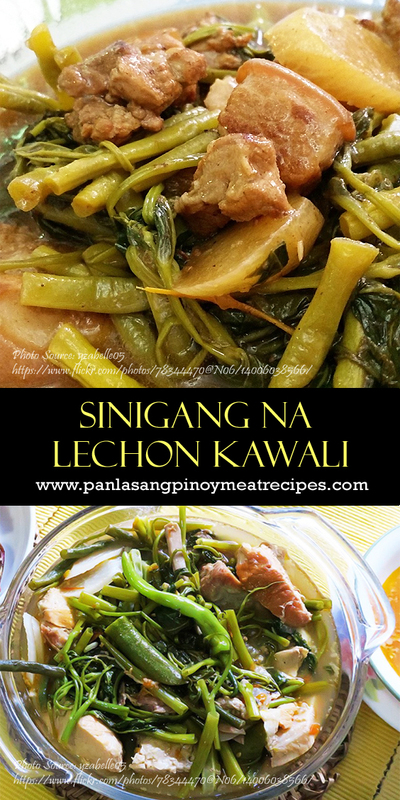 A unique way of cooking pork sinigang that uses lechon kawali. This is a great idea of recycling your left over lechon kawali! Slice the pork belly in two to three portions so it would fit the pot. In a medium size pot, put the pork belly and enough water to cover the meat. Put also the onions, spring onion, garlic, salt and pepper. Bring to a boil and cook until the meat is almost tender. Don't overcook. Drain and transfer to a colander or rack to dry. Then deep fry the pork belly until golden brown. Slice to serving pieces and set aside. In a pot, boil the tamarind fruit with 2 cups of water until the tamarind is soft. Strain the fruit and extract the juice. Set aside. In a medium size pot, saute onion and tomatoes until the onions are soft. Then pour the tamarind juice. If fresh tamarind is not available, then use sinigang mix. Then put 4 to 5 cups water or rice washing. Put the taro root (gabi) and boil until soft. Add some water if necessary. Then add in the string beans and radish and continue cooking for about 2 minutes. Add some patis to taste, then add the kangkong and siling haba. Simmer for 1 minute more. Add in the lechon kawali, stir and simmer for 1 minute or less. Serve hot. Thanks for this recipe! Im glad I found this sinigang na lechon kawali recipe. My husband was craving for this dish two days ago. Hi Marian, thanks also for visiting this recipe blog and I hope you will try the other recipes on this blog!